Let us help you choose the right plan for creating your next event experience! Every event created with The RSVP App is really a nested event. 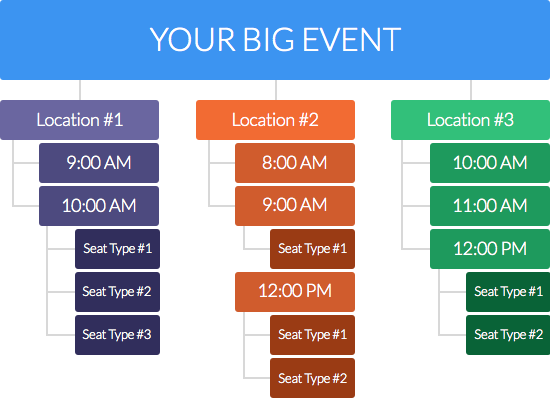 Nested events can contain unlimited locations, date/time slots, and ticket types. Nested events give event creators tons of flexibility no matter how many locations, dates, and times the event has. For example, let’s say you’re inviting guests to a conference with different workshops. With nested events you could setup a single event which has different workshops happening on different days and at different times. Technically The RSVP App considers this one event (the conference) because it can handle all of the nested events (the workshops) inside that event. The RSVP App has 2 plans: One Event RSVP and Unlimited Event RSVPs. Each plan has the option of month-to-month, or, yearly billing cycles. Choose our One-Time Event plan when you only have one big event registration at a time. The One-Time Event plan is perfect for seasonal events, conferences, and other events. This plan is a one-time cost and supports all the features. Choose our Unlimited Events plan if you manage more than one big event registration at the same time. Unlimited Events plans are perfect for event creators managing multiple separate event RSVPs simultaneously. For example, an organization may be accepting registrations for a summer camp, week-long conference, movie premiere, and community dinner all at the same time. Our Unlimited Events plan can handle all this and a lot more! Get started with The RSVP App, or, kick the tires with our demo.